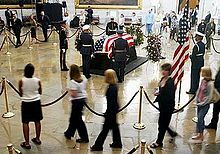 Ronald Reagan, 40th President of the United States, lying in state in the United States Capitol Rotunda as spectators and mourners file past his flag draped casket on June 10, 2004. A state funeral is a public funeral ceremony which is made for people who died that were very important in their country. Usually with a state funeral, there also comes a day where everyone mourns the person who died. Often, state funerals are given to royal or political people such as Presidents, Prime Ministers, Dictators, Governors, Mayors, Senators, or Vice Presidents. Military people and people who are famous for other reasons sometimes have a state funeral. This page was last changed on 22 November 2016, at 14:18.